The Innovation for Development Report provides an in-depth examination of the conditions that foster innovation so that they can be replicated globally. The Report provides valuable insight into how we can inspire minds around the world and accelerate our journey toward the future we imagine for ourselves. I encourage you to think deeply about the Report, discuss it with others, and consider the many ways we can apply these lessons to make innovation central to how we function as nations and as a global society. The relative importance of various drivers of economic growth and prosperity has evolved over time, and, for a growing number of countries, innovation in its many dimensions is emerging as a leading factor. The Innovation for Development Report provides a comprehensive look at the role of innovation in enhancing the development process. 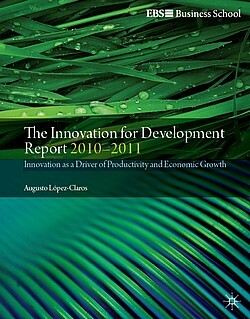 The Report is divided into three thematic parts (see contents here).pdf The first features the Innovation Capacity Index, a methodological tool that examines a broad array of factors, policies, and institutions that have a bearing on strengthening innovation in a large number of countries. The second part of the Report contains several papers from leading experts addressing different dimensions of innovation. Among the questions addressed: the impact of innovation and knowledge spillovers on the economic growth and development potential of developing countries, the learning economy as a phase of economic development, social entrepreneurship as a key innovation for the business community in the 21st century, breakthrough innovation and the growth of innovation clusters, and the future role of technological innovation in international efforts to mitigate the effects of climate change, among others. The third part of the Report will present innovation profiles for 70 of the most important countries, which account for the lion’s share of world output.